Last week Michael gave me the best present in the world! He asked me to marry him on our fourth anniversary together. I am basically the happiest person on Earth. And right now, maybe the most prone to getting into a car accident. Engagement rings should come with a warning label that says driving with your left hand can, and will, distract your eyes from the road. 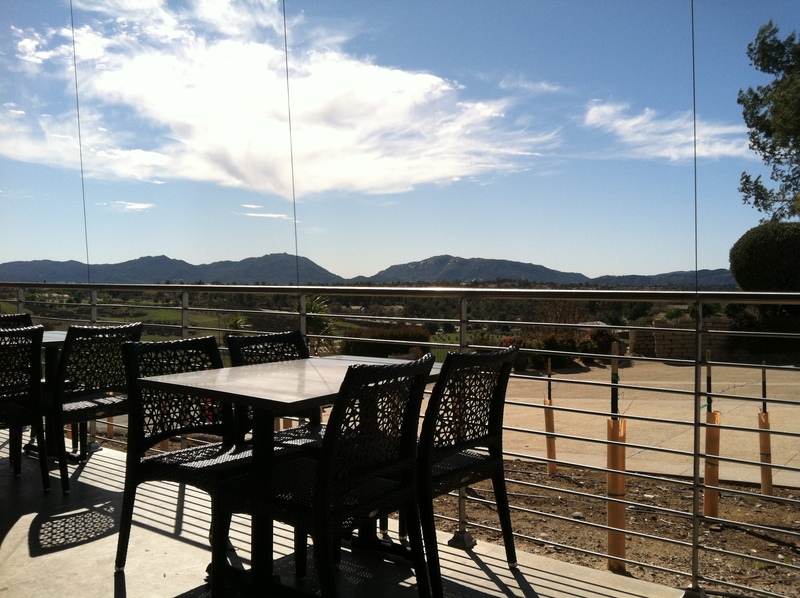 I’ve used this blog to share, and selfishly document, some of the happiest events in my life. I am so thankful I did because with time you tend to forget the small, but significant details. Here’s the latest, and greatest, story thus far. Valentine’s Day just happens to be the day we celebrate us. 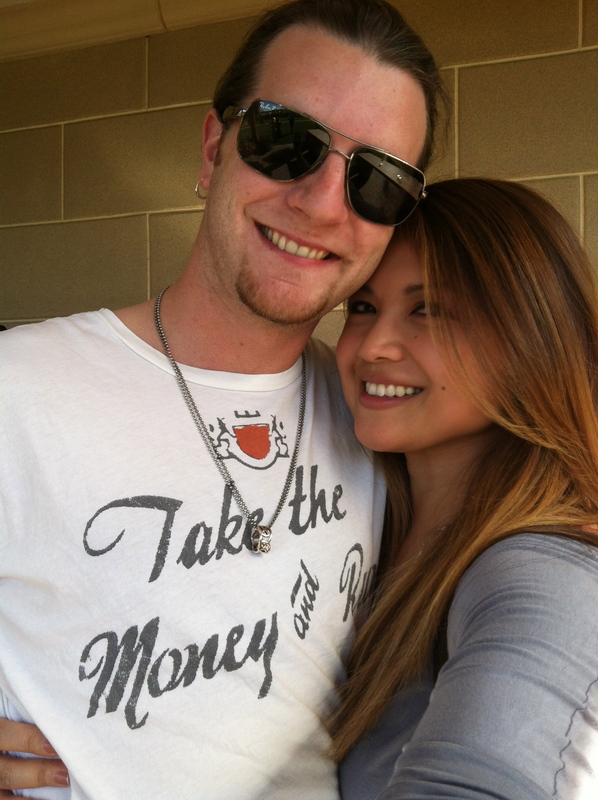 It was four years ago that Michael asked me on our first date. This year, he asked me to marry him. 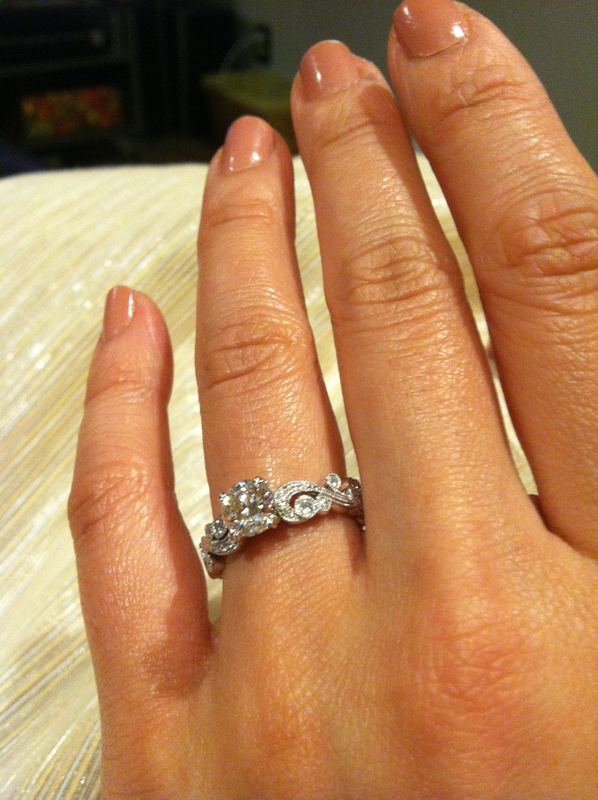 With the most incredible proposal a girl could ask for. Our anniversary fell on a Thursday, and I was told our plans were a surprise. Michael wasn’t giving any details – – he resisted even my most ninja efforts to crack him. All I was told was to be home at “the usual time.” When I arrived at our apartment, all looked normal – – lights on, music playing, but no Michael. I walked into our bedroom and found a brand new outfit laid out for me. 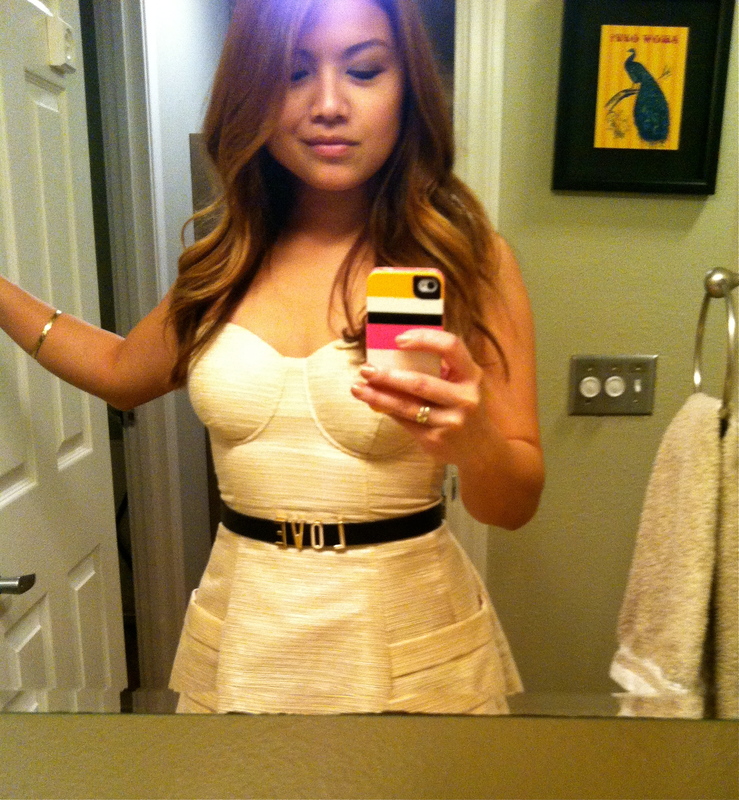 Dress, shoes, belt, the works. And a set of instructions. I am speechless already. Thoughts racing through my head, I must have stood in that spot for a solid five minutes. I had one hour to get ready before a limo would pick me up. I would receive a message when it arrived. It was straight out of a James Bond movie. And for once in my life I didn’t want a whole hour to get ready! I must have done 15 laps around our apartment in that hour. The dress and shoes fit perfectly (thank God!) and I felt like a doll. I couldn’t have chosen a better outfit myself! And as promised, the limo arrived on time. I walked downstairs and was greeted by the limo driver, Frank. He opened the door and there was my guy, waiting for me with PBRs and a bottle of Jameson 12-Year – – I fell in love with him all over again. We drove a short distance to Sunset Cliffs in Ocean Beach where Michael proposed. I couldn’t tell you exactly what he said or exactly what I said, but I’ll never forget that moment. It was complete happiness. The entire drive to dinner was filled with hugs, kisses, tears, and phone calls to family. Even Frank the Limo Driver came prepared with tissues on hand for me. 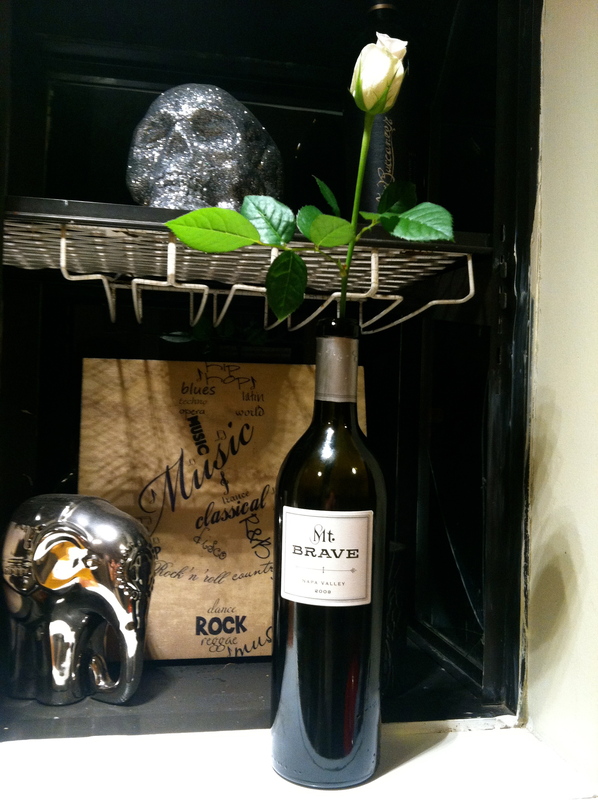 At dinner we had an amazing bottle of red wine called “Mt. 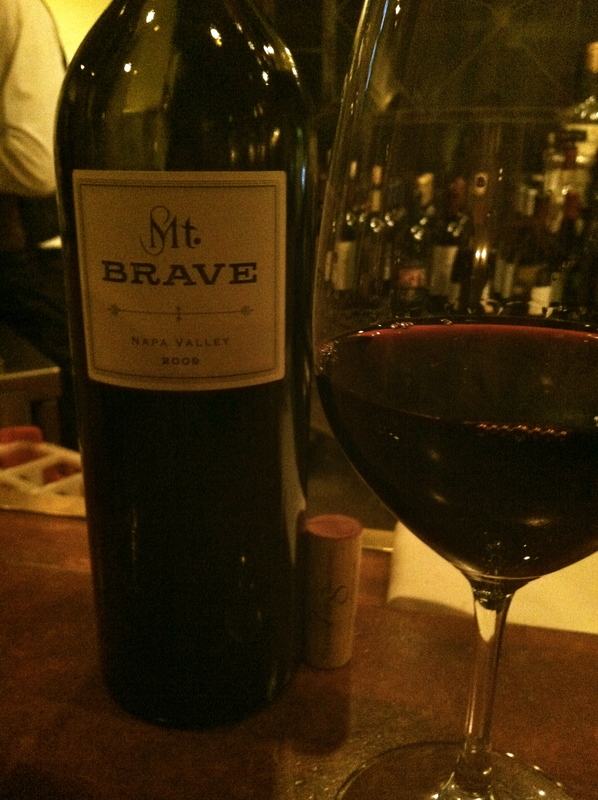 Brave”, coincidentally bottled in 2009. Four years ago. Might be our new favorite. 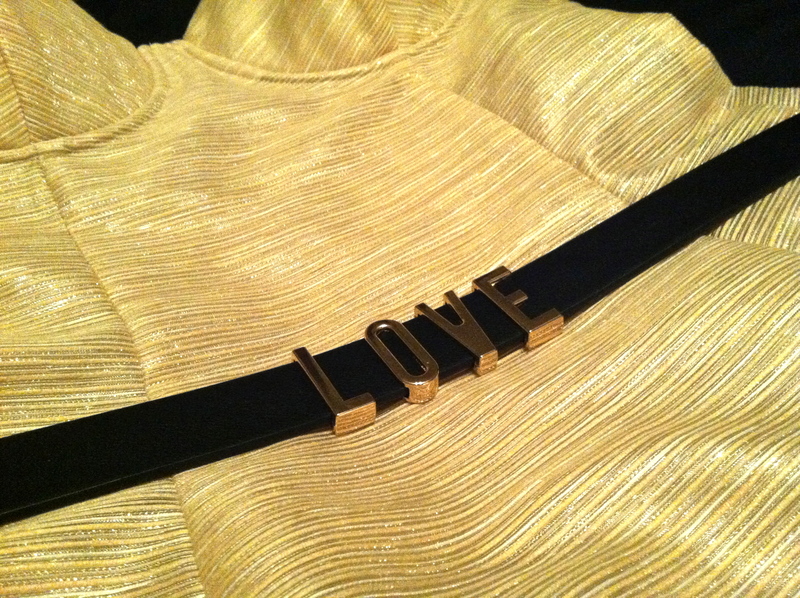 A partial shot of the night’s outfit. But Michael wasn’t done yet. There was an entire weekend of events planned! Another incredible dinner on Friday night, a wine tasting trip on Saturday, dinner and a hotel room downtown that night, and a visit to Los Angeles on Sunday to celebrate with my brother and sister-in-law! I have never felt more loved (and spoiled) in my life. The amount of planning this must have all taken! 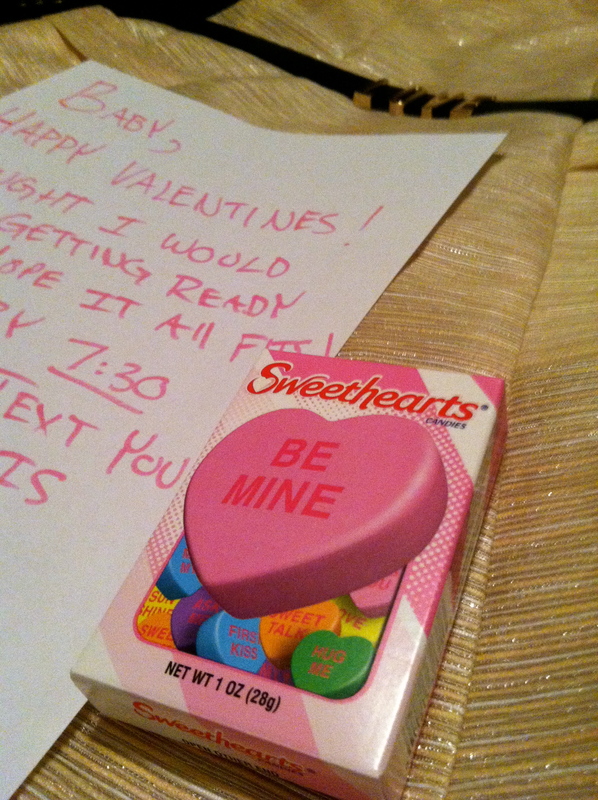 I would have gone crazy, but my husband-to-be pulled it off without a hitch. This anniversary is one for the books; the start of our very long, happy story. 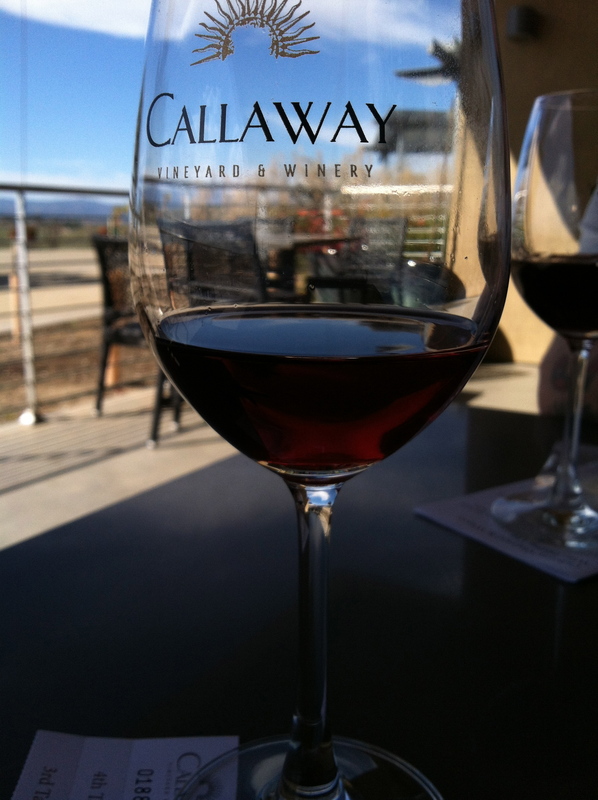 Callaway Vineyard & Winery, Temecula, CA. 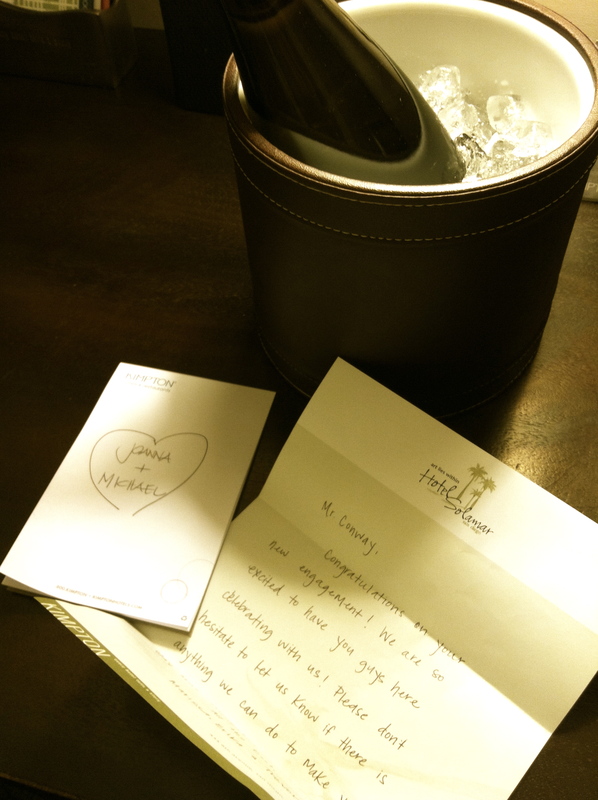 Champagne and a note from the Hotel Solamar in downtown San Diego. 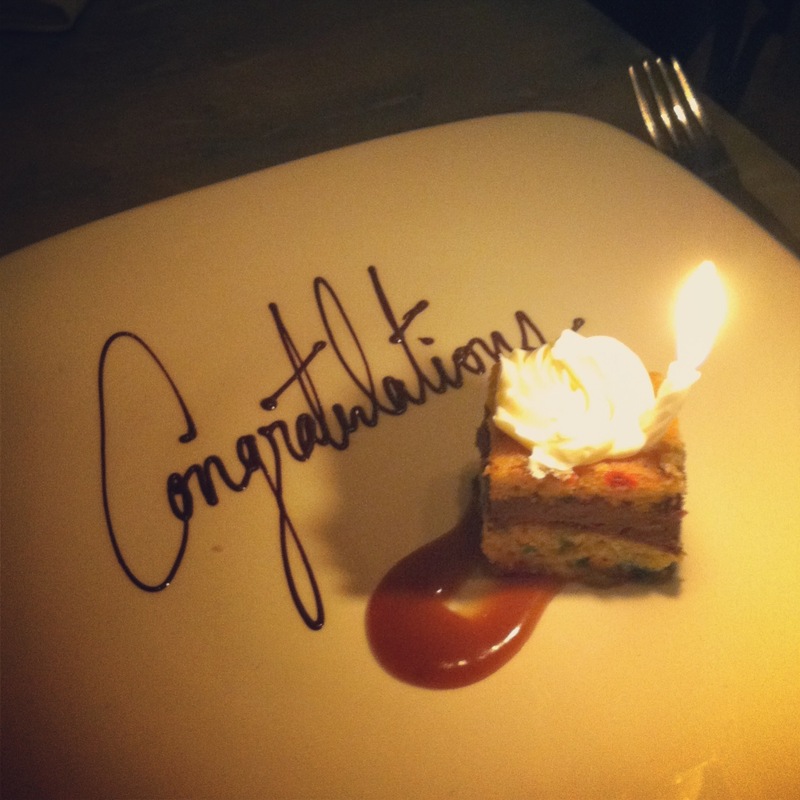 A surprise congratulations at dinner.